Jackie was perhaps happiest on stage. His wild creative energies were unleashed on appreciative audiences at venues including Playhouse of the Ridiculous, La Mama E.T.C., the Poetry Project at St. Marks Church, Bastianos Theater, Pyramid, and many other Manhattan theatres. His talent transcended gender and he reveled in melodramatic female roles. Curtis was playwright for some of his best roles, too! 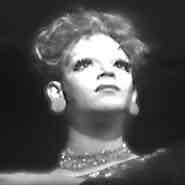 In 1970, Jackie Curtis auditioned in drag for Busby Berkeley's revival of the 1920s musical "No, No, Nanette" - too bad Busby Berkeley and Broadway weren't ready for Curtis in the chorus line! Jackie starring as Nola Noonan in "Glamour, Glory and Gold" in 1974 (recorded on videotape by Craig Highberger) considered by many to be Jackie's funniest play.